A to Z Rental has provided Mankato with everything from Wedding & Party Tents to Contractor and Moving Equipment since 1968. A to Z Rental Center tables & chairs have been attending garage sales, weddings and parties for forty years. Whether your event is a simple graduation or a grandiose wedding, A to Z Rental Center can help you plan your party. Party, Wedding & Canopy Tents are for good and inclimate weather. Use our Tables & Chairs before, during and after your party. 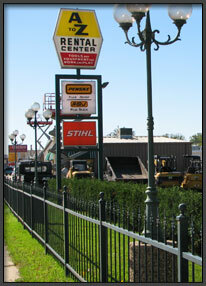 A to Z Rental offers one of the most extensive & comprehensive inventories in Southern Minnesota. Construction Equipment small and large. Home Improvement items to cover all your Honey-Do lists. A to Z Rental has been an ASV Track Loader Dealer since 2003. We offer a full line of ASV Track Loaders for rental & sales. A to Z Rental has been selling, renting and repairing Honda Engines since 1979. Honda has been providing the Rental industry with one of the finest power plants available. The durability and longevity of Honda Engines in this field is unmatched. Opened in April of 1968 by Agnes & Harry Kullberg & their nephew Bill, their entire inventory fit into the building that now houses their showroom. Beginning with just a few tables & chairs, garden tillers and numerous items the franchise require the store to have. Since 1979 A to Z Rental has been independently owned & operated without a national headquarters to answer to. A to Z Rental has since become a household name in Mankato.